I was at my doctor’s office for a routine checkup (a clean bill of health thanks!) and my Doctor typed a summary of the visit and provided a printout of it for my records. This is mostly for her but I like having the copy of our meeting too (instead of just the bill) for medical records. I noticed when she was compiling the summary, she did it with very few keystrokes and with lightning speed. I asked her how show typed it so fast and she said she uses text expansion software. She recommended I look into. Doctor’s orders! For those child care administrators and directors new to text expansion or substitution software, like me, it behaves a lot like Microsoft Word’s spellcheck but everywhere in your computer you can type, not just word. The difference being, in a sense, you deliberately create misspelled words that are replaced by any block of text you want. Let’s assume you send a lot of emails in response to questions from parents. A salutation might be “Have a good weekend!” Now, this is something you would not include in every email, like in the email signature, but emails you send on Fridays. This is a perfect for text expansion. Simply set a rule to replace ;gwe with “Have a good weekend”. Its that easy, I cut my typing from 22 key presses to just four. 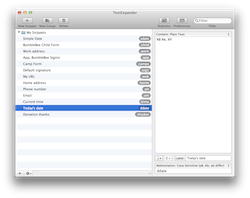 Text expansion programs like TextExpander for Mac all have a similiar setup. A code word like ‘ddate’ is automatically replaced with today’s date. Best of all there are a lot of free and full-featured/low-cost programs to do this. For the Mac, there’s TextExpander (currently $34.95), TypeIt4Me ($4.99) and DashExpander (free). On the PC, there is only one real solution in my book and that is AutoHotkey (free). It’s free and infinitely flexible. ;gwe → Have a good weekend! And on infinitem… You might think this is a lot to create and remember but you’ll be surprised at how easy this becomes part of your daily routine. Here are a few that I think all child care directors can use on a daily basis. ;drop → Drop-off hours are from between 7:30 and 9:30.
;pick → Pick-up hours are anytime before 6:30.
;fee → Our late pick-up fee is $1 per minute over 6:30. Are there any forms that you have to repeatedly fill out online or with a state licensing agency? Another example, do you have to do 1099s or time cards for your employees and have to type in your name, EIN, or address repeatedly? Or is there a spreadsheet you have to repeatedly fill in with one of four peices of text? These are all great uses for text expansion. Text expanders can also mimic key preypresses and even mouse clicks. For example, when I demonstrate BumbleBee’s online parent application, I have a child already setup so that I can put in the name, birthday, etc. into the online parent application. When I type: ;child, the text expander places the child’s name ‘Connor Exampleworth’ tabs to the next field, places the birthday, tabs to the next field, and places the desired start date. Text expansion can get quite sophisticated, like filling in forms. In this example, I typed ‘;child’ and the child’s name birthdate and desired start dates. 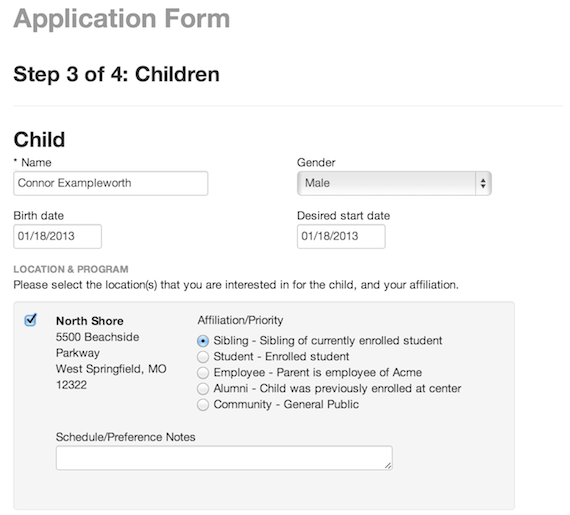 It completes the online child care application with a couple keystrokes. Of course, you don’t want to put sensitive things like passwords, social security numbers, children’s birthdates, because the text expansion files are not password protected. Give it a shot for a month with just some basics: names, addresses, phone numbers, etc. Have a blast. If you are like me, you will start noticing words you type frequently and start compiling them. Pretty soon you will be typing with many fewer keystrokes. My guess is you will wonder how you ever lived without text expansion. Do you have any ways that you save from repeating yourself as early childhood education professional? Have you ever done any text expansion?